CHARLIE`S BURGUNDY VELVET LONG DRESS PROM PARTY. SIZES TO CHOOSE FROM 10-12-14 AND 16. FLOOR LENGTH WITH SIDE HIGH SLIT. Silver Dress. Condition is Used. Dispatched with Royal Mail 2nd Class. Ne ve r wo rn h as s il ve r th re ad t hr ou gh i t be au ti fu l.
New Look Black Velvet Dress With Gold Stars Size 14 Brand new without tags Lovely simple shift dress with gold stars. Selling due to a wardrobe clear out. Grab a bargain! Dispatched within 3 days using Royal Mail 2nd Class. Payment within 48 hours or an unpaid item cause will be automatically be opened. This is so dark a blue that I thought I was listing it wrong! It was a friend's who has moved into sheltered accommodation and unfortunately no longer has a use for it. It hangs beautifully on and has 10% lycra for the perfect fit. Decent used condition. Measurements to follow. Long Sleeveless Midnight Blue Velvet Dress Size L. Condition is Used. Dispatched with Hermes. long black velvet dress size 16 cowl back sparkle detail evening dress. Immaculate condition worm once. Dispatched with Royal Mail 2nd Class. L o v e l y body con d r e s s good c o n d i t i o n small, 8. P a d d e d l ow plungeb u s t line,o f f s h o u l d e r d e s i g n. B a c k zip. Sequin and velvet mixed bodycon dress with short sleeves. Colour: black. 86cm length. 96% Polyester,4% Elastane. Machine washable. Red Velvet 1940’s Dress Size 14. Rockabilly, goth, steam punk labels removed but never worn Dispatched with Royal Mail 1st Class. Missguided Black Velvet Knee Length Bodycon Dress Size 12. Condition is used but very good. Has boning in the bust for support. Dispatched with Royal Mail 2nd Class. Lovely lined Boden Martha dress in size 14 P (petite). Length from neck (at front) to knee 35". Beautiful black velvet dress with textured bottom. High neck and long sleeved. Size 14. Worn once. Excellent condition. Great outfit for the festive season. Topshop Floral Skater Dress Velvet Size 8. Condition is Used. Dispatched with Royal Mail 2nd Class. Leopard Skin Print Velour Dress With Gold Detail Size 12. Condition is Used. Dispatched with Royal Mail 2nd Class. 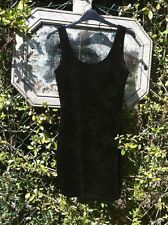 In The Style Black Crushed Velvet Bodycon Dress Size 10. Dispatched with Royal Mail 2nd Class. New Look Ladies Burgundy Velvet Bardot Midi Party Dress UK 8 - In excellent condition - worn twice. - Figure-hugging with flattering neckline. - From a smoke and pet free home. - Free postage and packaging. Lovely white / silver dress from missguided. In good condition, size 8. Black Velour Dress With Shirt Collar. Condition is New with tags. Original originally from H&M. Dispatched with Royal Mail 2nd Class. Green Velvet Skater Dress. Condition is Used. Dispatched with Royal Mail 1st Class. Black Mini Zip Up Bodycon Velvet Dress Size 8. Condition is Used. Dispatched with Royal Mail 2nd Class. Brand New Missguided Gold Velvet Bodycon Dress, Size 8, Rrp £25,With Front Split. Dispatched with Royal Mail 1st Class.